Advocate Lourens obtained a B.Comm and L.LB degree from the Rand Afrikaans University (now the University of Johannesburg). At present Advocate Lourens is studying towards a Master’s Degree with the University of the Witwatersrand, Johannesburg (Business and Commercial Law). Advocate Lourens’ practise is commercial in nature with an emphasis on contractual-, banking-, credit-, insolvency- and delictual litigation. A smaller portion of his practise includes general civil litigation (such as interdicts, injunctions and insurance matters). He regularly appears in the Regional and High Court Divisions across the Republic of South Africa. 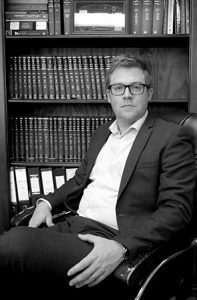 In addition, Advocate Lourens represents clients in commercial arbitrations, tax inquiries and labour matters. Before being called to the bar, Advocate Lourens practised as a commercial litigation attorney in Johannesburg, South Africa for 2 years. Advocate Lourens successfully completed his pupillage under the guidance of Advocate Greg Amm. He was accepted as a member of the Johannesburg Bar and the Maisels Group, in 2010. Since then Advocate Lourens has been practising independently for his own account.